“Party Sub,” a six-foot long submarine sandwich made of wood, rubber, and paint, will provide the collector with the opportunity to purchase art by the linear foot. The sandwich will arrive at NADA Hudson as a whole and will be divided during the course of the weekend as determined by each collector. 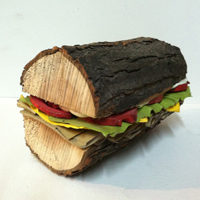 The artist, Brent Owens, will be on site to “carve” the sandwich into lengths of one-foot increments. “Party Sub” is an extension of the artist’s project “Knickerbocker Maw,” an online store that draws inspiration from the commerce of Knickerbocker Avenue in Bushwick, Brooklyn, where the artist’s studio is located. In line with the bargain-oriented nature of Knickerbocker Maw and Knickerbocker Avenue, “Party Sub” will accommodate the budget of the thrifty fair-goer, allowing he or she the option of purchasing the amount of artwork that suits each personal budget.